Add Celery Salt to the wet rim of an highball glass. Swipe a lemon wedge on the rim to prep the glass. Pour the Clamato juice and the lemon juice in the glass filled with ice. According to Wikipedia, it was invented in Calgary, Alberta in 1969 by restaurateur Walter Chell to celebrate the opening of a new Italian restaurant in the city. It quickly became a popular mixed drink, but remains virtually unknown outside Canada. 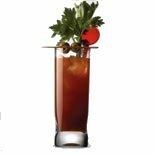 This drink was created in Alberta, the Bloody Mary's actual origin is open for debate. Several people claim that they created the drink. It's a fairly simple recipe. It wouldn't surprise me that many people came up with the idea about the same time. Not everyone likes sweet drinks. This savory blend probably ended up being invented at someone's home by mixing together whatever was available to get intoxicated with. Add an egg yolk and you have brunch. Tony Bennett? Ceasar's Palace? You Americans kill me. Good research job. Try digging a little deeper, eh.